UPDATE: Unfortunately the Bay Area Free Book Exchange is closed as of May 2015..
Visit the Bay Area Free Book Exchange (open every Saturday and Sunday from 9 am to 6 pm in El Cerrito) and take home up to 100 books for free. Yes, all 10,000+ books on all the shelves are available to the public, free of charge. It is like an ever-changing treasure hunt among thousands of books. Since 2009, they have given away over 500,000 free books. Donations of Books Accepted: If you have books you don’t want, you can donate your used books. Children’s books are always in need. 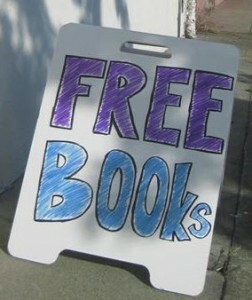 Although donations are greatly appreciated, it is not a requirement to come and get free books.